Betty J. Long, age 90 of Stanwood, passed away on Thursday November 15, 2018 at Unity Point St. Luke’s Hospital in Cedar Rapids. Funeral services will be held on Tuesday November 20 at 10:00 A.M at the Stanwood Union Church with Reverend Paul Uzel officiating. Burial will follow at the Stanwood Cemetery. Visitation will be held on Monday November 19 from 4-6 P.M at Chapman Funeral Home in Clarence. Betty was born on August 20, 1928 to Wilbur and Mable Conrad in Tipton, Iowa. She married Ira (Mike) Long on June 2, 1952 at the Little Brown Church in Nashua, Iowa. He died on March 10, 2009. Betty taught school, mostly kindergarten, in the Lincoln and North Cedar school district for 43 years. She retired in 1993 but continued to sub for 16 more years. 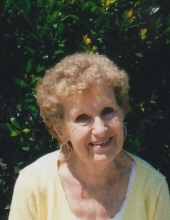 Betty was involved in the Stanwood Library and served on the board, served on the Stanwood City Council for two years, joined the Stanwood Union Church and served on many committees. She played bridge and thoroughly enjoyed the bridge ladies from Tipton. Betty belonged to a Thursday morning coffee group and enjoyed eating with friends every Monday night at Ditto’s. She is survived by her son, Michael (Michelle) of Lisbon; grandchildren Lindsae (Steven) Long Herlocker and Nicholas Long; great granddaughter, Adeline Herlocker; sister, Joyce Chiles of Coralville; and special friends, Marge Doser & Nancy Christiansen. Betty was preceded in death by her parents; husband; and brother, Don. To plant a tree in memory of Betty J. Long, please visit our Tribute Store. "Email Address" would like to share the life celebration of Betty J. Long. Click on the "link" to go to share a favorite memory or leave a condolence message for the family.